Lilly and Liam's puppies were born on May 23-24, 2016. ​There are 3 girls and 3 boys. All puppies from this litter have been sold. 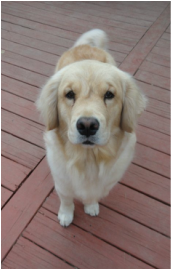 Lilly is a 5 year old AKC Golden Retriever from championship lineage. She is the daughter of Chloe and Casper. Her hobbies include outrunning her mother in fetch, swimming, giving kisses, trying to be a lapdog, and finding lost tennis balls in the woods. She is the athlete of the bunch, excelling in retrieving. She is very loving and gentle in nature. Lilly has a light golden wavy coat with white feathering. She weighs 74 lbs, has a blocky head and a stocky frame. Lilly loves cats and young children. 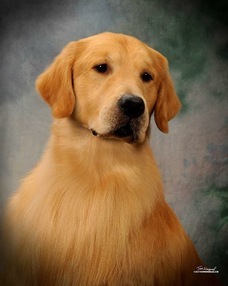 Liam is a 5 year old Golden Retriever who is highly regarded in the show ring. He won his Grand Championship at 2 years old. He won Best In Show at The Providence Kennel Club. He is in The Show Dog Hall of Fame. Liam has a beautiful head and is a moderate sized dog. He carries a full coat, good pigment, and has a soft expression with dark eyes. He has a fun loving personality, and enjoys entertaining others with his antics.. Liam enjoys playing with his dog friends at home. He likes watching ducks fly overhead.